Unlike that off-limits room at home that's just for "show," this Wrangler Workwear Men's Light Blue WS10 LB Canvas Long Sleeve Shirt not only looks good, it's also made to perform like a champ no matter what the work day brings. Made in a 5.25-ounce sturdy canva ... (see full details) (see specifications) #WRGWS10LB. Unlike that off-limits room at home that's just for "show," this Wrangler Workwear Men's Light Blue WS10 LB Canvas Long Sleeve Shirt not only looks good, it's also made to perform like a champ no matter what the work day brings. Made in a 5.25-ounce sturdy canvas weave, this light blue shirt is manufactured in a blend of 60% cotton and 40% polyester, to deliver the best of both worlds -- the soft, breathable comfort of cotton and the durability and wrinkle-resistance of polyester. It's built for both workday comfort and good looks. The straight-bottom hem with side vents looks good in or out. Left untucked, you get plenty of breathable moving room, too. For even more comfort, full seamless underarm gussets give you a greater range of motion in each arm and also add durability. Permanent collar stays in the banded collar keep your look neat and professional at all times. Dual hex-style chest pockets with button closures add storage space, and an external pencil stall on the left chest pocket adds convenience. Double-needle stitching throughout this ready-for-work shirt keeps every seam cleaner and stronger. Because two threads were used, instead of one, you get more strength. 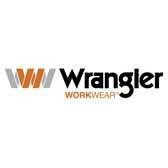 Because taking care of your work shirts shouldn't be another job, Wrangler makes this one easy care. Wash it at home or industrial laundry, light soil. It's finished to retain color, release soil, and be wrinkle-resistant. Don't let the good looks fool you. This Wrangler Workwear Men's Light Blue WS10 LB Canvas Long Sleeve Shirt is tough, durable, and hardworking, just like you. Wrangler has done it again with this shirt. I don't use this as a work shirt, but as a night on the town dress shirt. As with all Wrangler shirts I have owned, the material is very soft yet tough, almost tear resistant. The light blue color looks good against a pair of blue wrangler jeans. I can't think of anything negative to say about this Wrangler button up shirt. It's just great. Wrangler Workwear Shirts: Men's Light Blue WS10 LB Canvas Long Sleeve Shirt is being added to your cart.